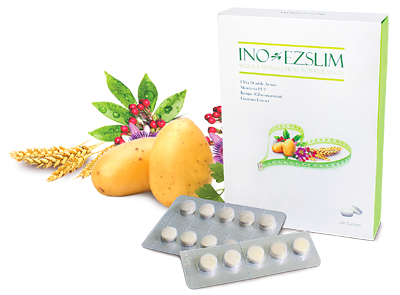 Ino Ezslim is a formulation of ultra double action weight management which contains patented fat-absorbing konjac, Slendesta® Potato protein and chitin that induces rapid satiety, reduces food intake without feeling hungry during diet, effectively block fat absorption, reduce the absorption of fat and starch, increase fat excretion, suppress appetite, thus help to transport fatty acids into energy production in the cell unit. Ino Ezslim has included natural ingredients such as guarana extract, various amino acids, carnitine that increase metabolic rate, burn fat and promote metabolism. Consume 1 tablet with 250ml water, 30minutes before meal. 2 tablets daily.